The Russian private military company (PMC) “Wagner” fought against Ukraine in the Donbas at the turn of 2015. Later its mercenaries were sent to Syria to support President Bashar al-Assad. Finally, Russia deployed “Wagner” mercenaries in several African countries. The group is supplied with equipment by the Russian army and Wagner often functions as an auxiliary of the Russian military. Therefore, it is believed to be a unit of the Russian Defense Ministry in disguise. Now the Security Service of Ukraine (SBU) has revealed some details on the “Wagnerian” deployment in African countries and states it has found that the PMC is a unit of Russian army’s Main Intelligence Directorate or the GRU. 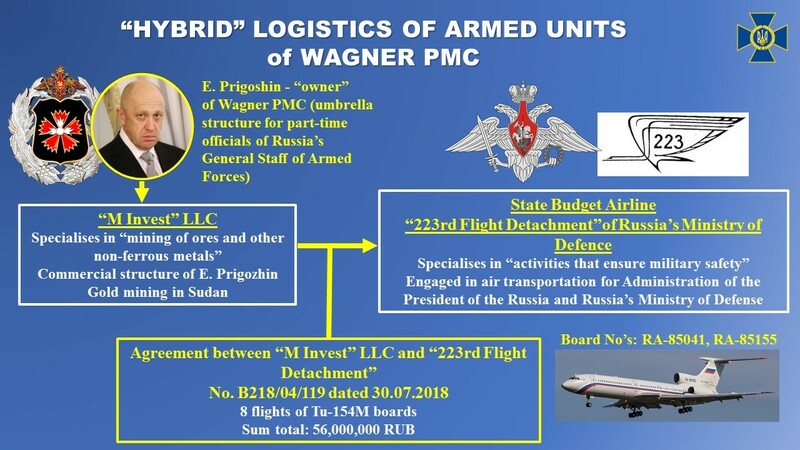 On 25 January, the SBU shared its materials claiming to have evidence that Russia delivers arms and personnel of PMC Wagner to Sudan, Libya, and the Central African Republic on planes belonging to the Russian defense ministry. The SBU reported that according to the 30 July 2018 contract No. В218/04/119 worth 56,000,000 RUB between the M Invest LLC and the 223rd Flight Detachment of Russia’s Ministry of Defence, two Tu-154M aircraft flew eight times from Moscow to the Sudanese capital of Khartoum via the Russian air base Khmeymim, Syria. From Khartoum the planes transported the mercenaries to the other two African countries, where PMC Wagner’s personnel is also deployed, the Central African Republic (CAR) and Libya. The logistics framework allows the Russian military command to regularly rotate the personnel of its mercenaries every other month, both in Syria and in Africa, the SBU says. Meanwhile, Sudan is used as a transit base for the supply of weapons and manpower to other African countries. On 28 January, SBU head Vasyl Hrytsak said that his agency holds information on the tickets, personal and passport data of the Wagner mercenaries whom Russia had delivered from Moscow to Sudan and further to CAR and Libya. SBU reported that it published parts of the available information, particularly, “the list of 149 persons who took a direct part in suppressing of democratic protests in Sudan at the beginning of 2019.” However, the infographics in the article mention only 57 persons at the moment and will be probably updated later. 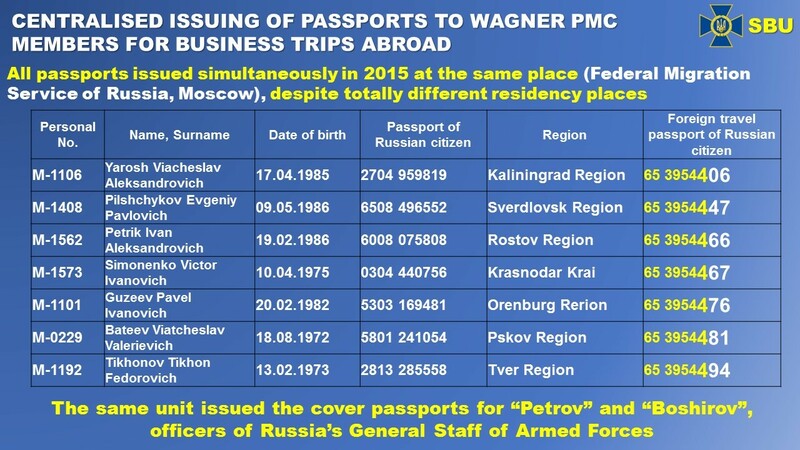 According to Mr. Hrytsak, having parsed the passport details of more than 1,000 members of PMC Wagner, the SBU found that “the vast majority” of IDs were issued centrally, in Moscow, despite the fact that the mercenaries lived in various regions. Moreover, they received their passports in the very same office of the Federal Migration Service of Russia, where the Salisbury attack suspects, GRU operatives “Petrov” and “Boshirov,” did. The SBU head says that the numbers of several hundred passports under question differ only by the last few digits. This means that they were issued within a short period of time. Together with Russian nationals, citizens of Belarus and Moldova were sent to Africa, as well as residents of the Russian-controlled puppet states. Crimean residents were present in the latest rotation. More than 90% of the African contingent of mercenaries in 2014-2015 participated in the military aggression against Ukraine.